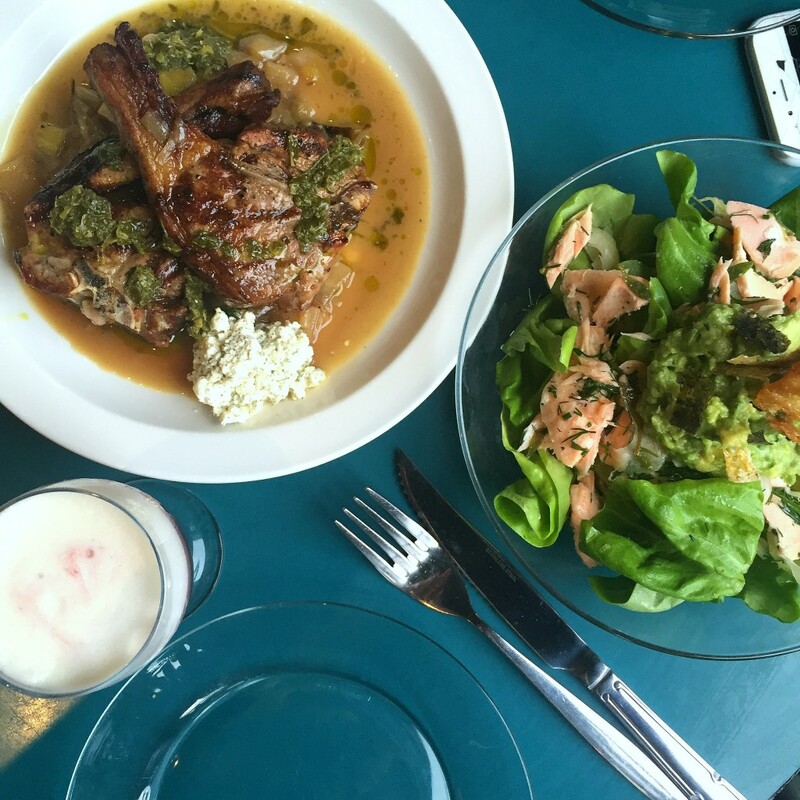 Retro dining has come to Exmouth Market in the form of Coin Laundry! Situated at the top of the Market this restaurant and bar which was launched late last year offers nostalgic British comfort food. I recently went to try their all-day menu on a very rainy spring day and I was very pleasantly surprised. Spread over two floors, it is a spacious and airy place yet it still feels intimate. Maybe this is because some of the lovely original pub features have been restored including beautiful decorative internal and exterior tiling. Wooden floors, comfy couches and simple homely designs are combined with great kitsch tableware. Coin Laundry offers a modern take on the era’s food and drink. Designed by Head Chef Nik Prescot, the menu at Coin Laundry looks to the 70s and 80s for inspiration to create dishes that offer a modern take on old-school British comfort food. Now I was not expecting to be wowed by the food because, well I’m not sure why. I suppose I couldn’t imagine I’d love the dishes but it exceeded my expections massively, and was a far cry from the image I had in my head. There is an All Day menu which comprises of small plates, large plates, salads, baps and sides and also a Bar menu which is full of little snacks that can be enjoyed on their own or with your meal. Looking through the menu reminded me so much of photos of my parents in the 70s and 80s with their friends. The menu really does take you back to that era with prawn cocktails, cheese and pineapple, spam fritters, chicken kievs and coronation chicken. But it definitely is not what is seems. These are old ‘classics’ refreshed and brought into the modern day and presented beautifully. The evening started with a cocktail whilst we decided what retro delicacies to try. 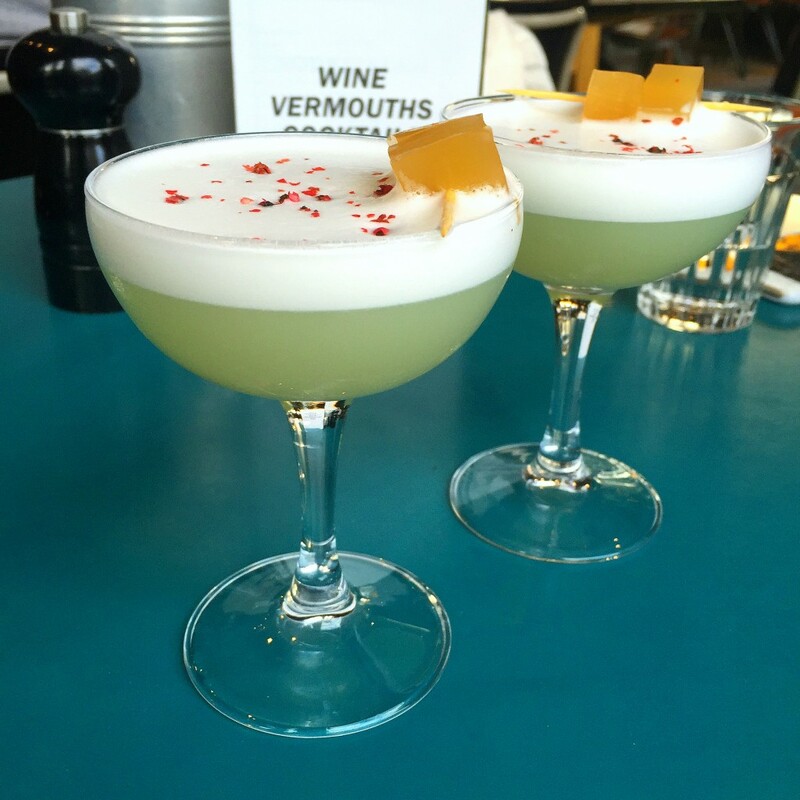 Always a lover of Pisco we ordered the Pisco Inferno (Pisco, pineapple shrub, lime, egg white, pink pepper). I’m not sure what the sprinkle of pink pepper added to the drink but I loved it nonetheless. It was light and refreshing and we very much liked the little jelly cubes too. The steak tartare had actually finished which was a shame, but, I was not disappointed with our other choices. 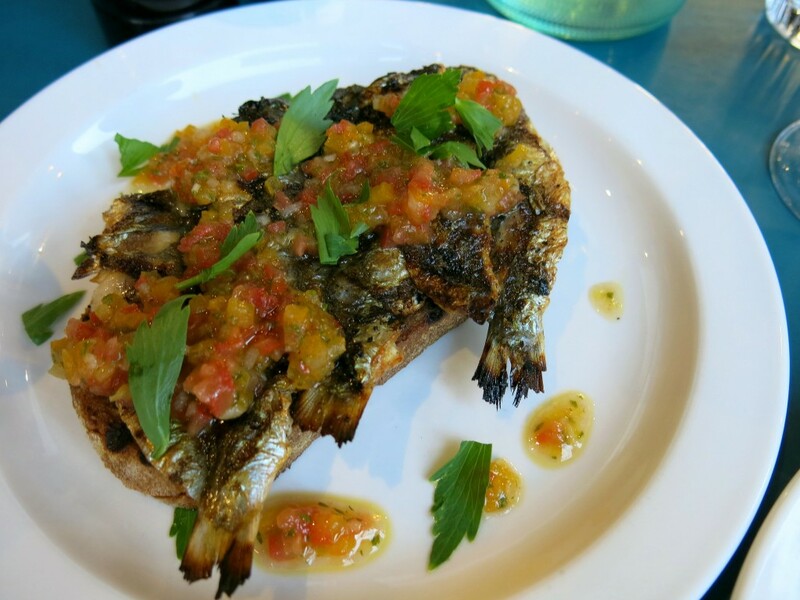 We ordered sardines on toast which came served like a bruschetta with chopped fresh tomatoes and parsley. The bread was very slightly over toasted but the combination of fresh tomatoes and grilled sardines was lovely. 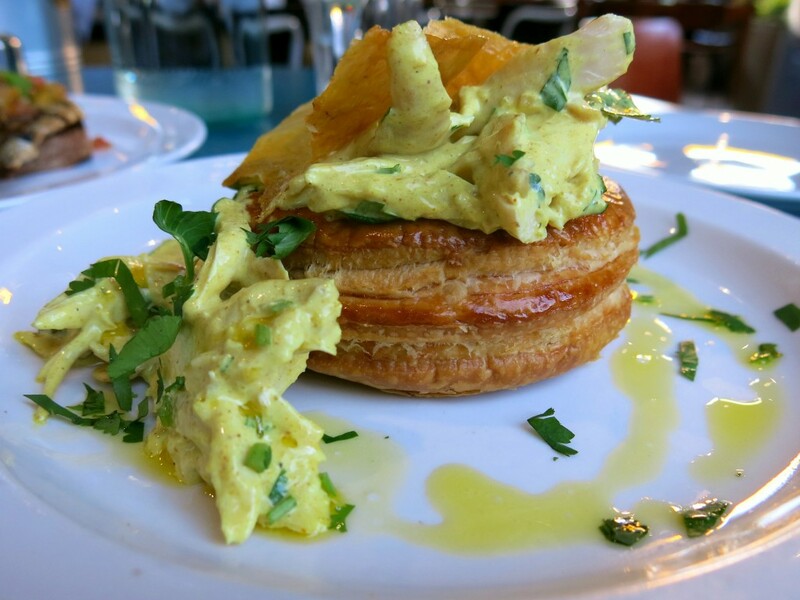 But the definite favourite was the coronation chicken vol-au-vent. 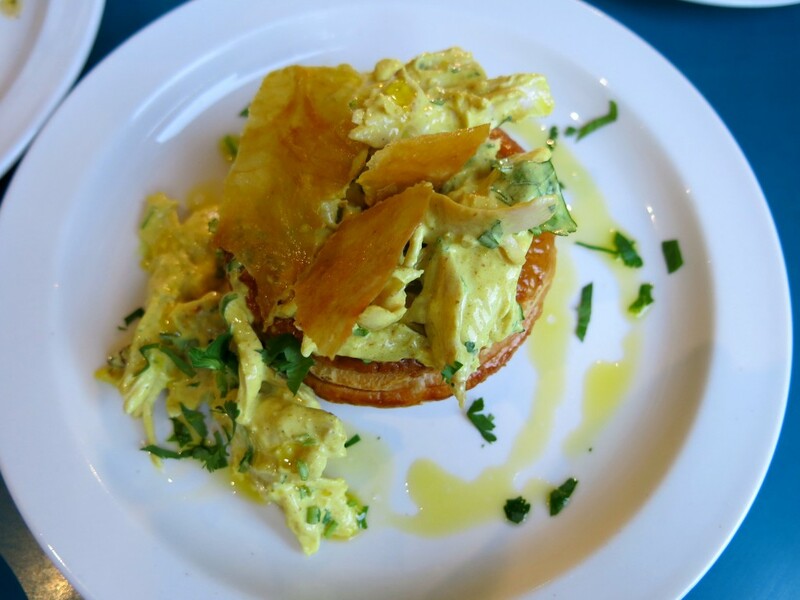 I expected this to come out on little vol-au-vents, but realised after it was singular on the menu. I loved it served like this! Topped with crispy chicken skin this was light and not heavily ‘mayonaised’. The spices were subtle and I could have eaten this all to myself. It was time for another cocktail! Although I was tempted to try one of the fruity Sodastreams on offer the cocktails were too good to miss. 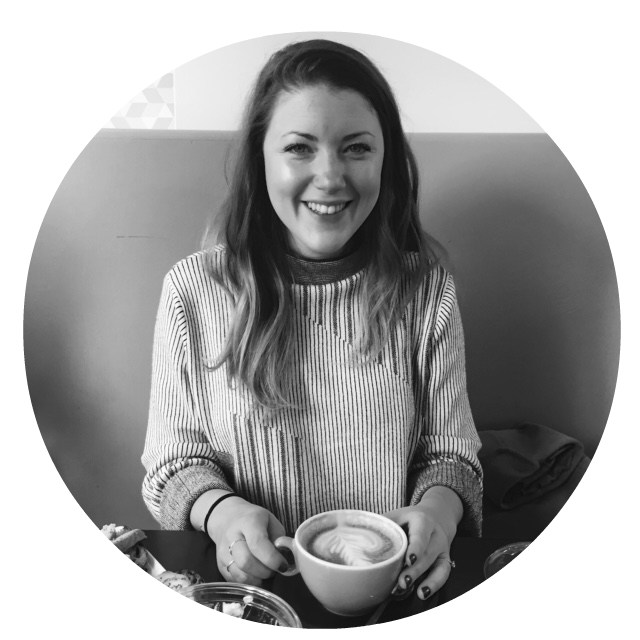 We ordered two Blind Dates, mainly because of the name but also because it sounded intriguing! 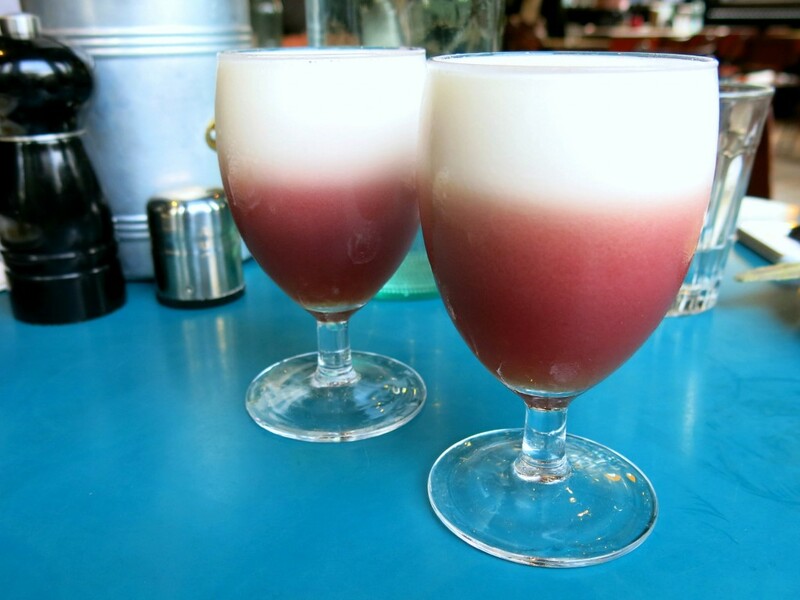 This cocktail consisted of date infused brandy, lemon, sugar, egg white and port. This was a sweet cocktail but not as sickly as is may look! The lemon kept it balanced. We asked the friendly waitress what she recommended on the menu and she said the lamb chops and salmon and avocado salad were great, so we went for one of each. The lamb chops were served with leeks and cottage cheese. This may sound like a strange combination but I quite liked the cottage cheese, it wasn’t runny how I expected it and the leeks were swamped in a lovely gravy. There was a little too much mint sauce on the lamb as it slightly overpowered the meat but it was definitely a tasty dish. The salmon and avocado salad was massive! It was so fresh tasting and great after the other rich dishes. 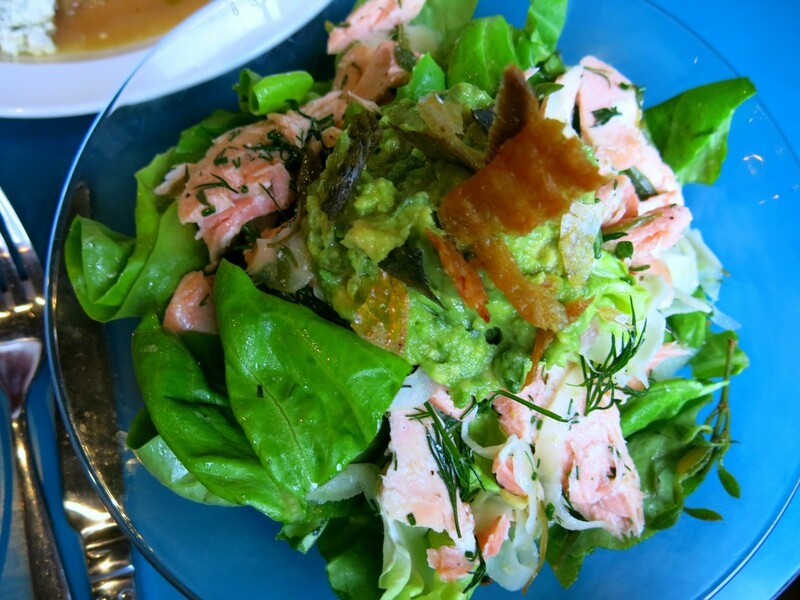 There was a good amount of salmon on there too making it an actual option for a main course – I hate it when a salad is pitched as a main but it’s only leaves with a sprinkle of topping! There was no dressing though and I do think it could have done with just a light dressing. We couldn’t resist dessert! 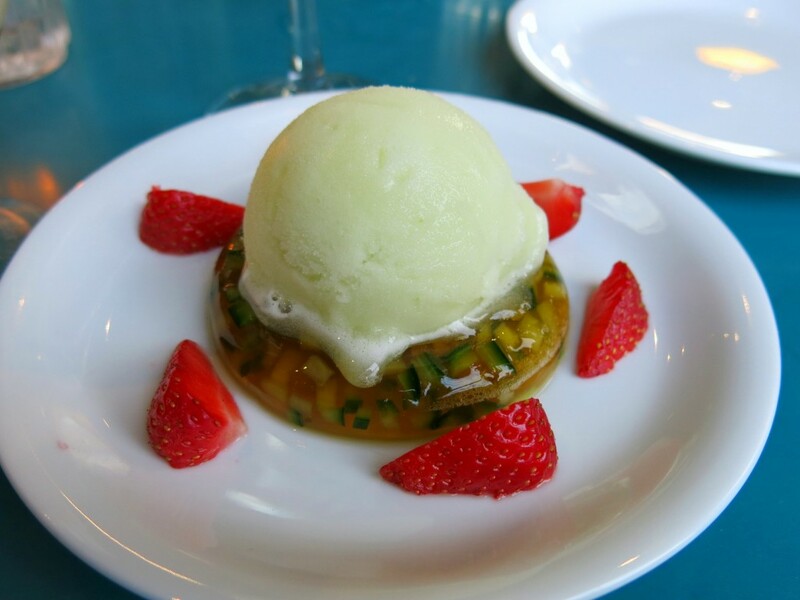 The Pimms jelly with Granny Smith sorbet was perfect after a big meal, the sorbet acted as a palette cleanser and the jelly was subtle and refreshing. But if you like cheesecake then you have to order the Pornstar cheesecake. Although it was very hard to get to the biscuit base because it have been so packed in, it was soon forgotten because the tangy passionfruit topping and creamy cheesecake was delicious. Yes I would. I love the decor in here and the cocktails are fab which makes it a great spot for a drink after work. But I really was totally impressed with the food too. I enjoyed the chefs take on some old school classics. 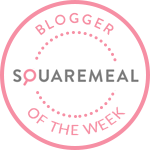 *I was a guest of Coin Laundry and my meal was complimentary, but as always my views are my own and my new love for coronation chicken is real! You do. In fact, I think everyone needs a pornstar cheesecake! 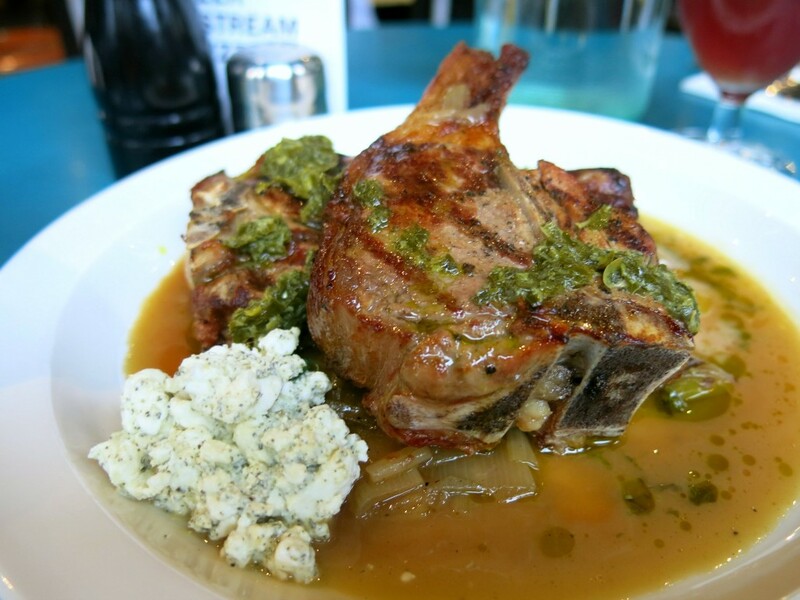 Love the look of the lamb chop but yes, the cottage cheese element raised my eyebrows too… seems like an odd combo but sounds like one I need to try! 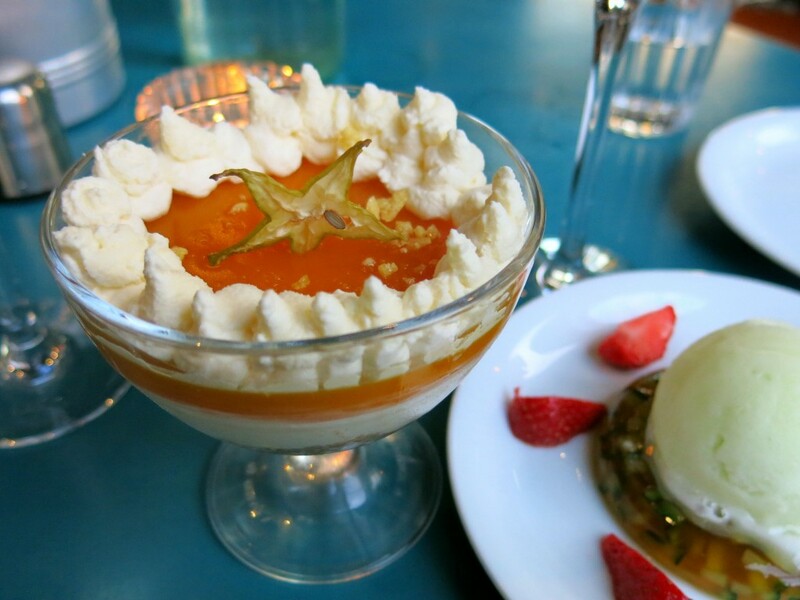 I’d also be keen on the Pimms jelly… so sucked in by the jelly itself! Yes, when I saw it on the menu I was definitely intrigued how it could work, but it did and was very tasty!